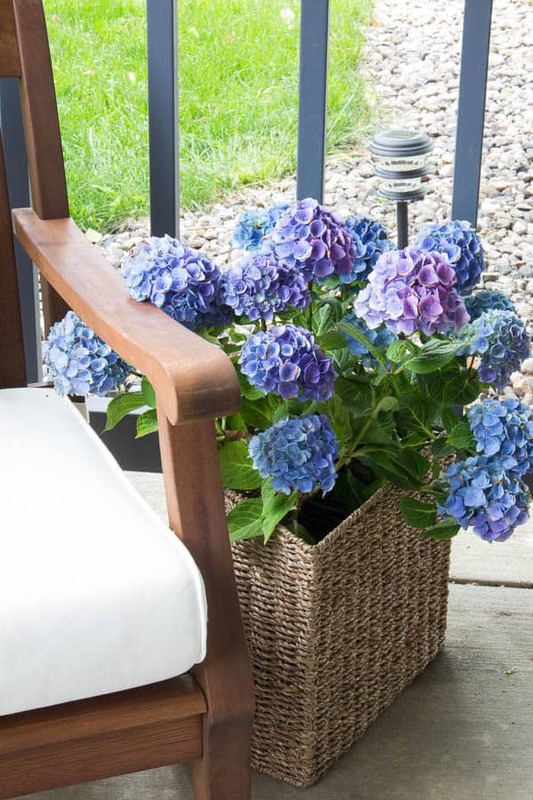 A few lovely accessories is all a small patio needs to go from drab to fab! 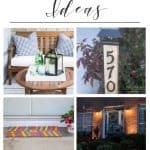 My front porch patio has been completely neglected since we moved in two years ago. But I am happy to say in just a few short weeks, all that has changed. Once I found the perfect seating, the other pieces just fell into place. So if you’re intimidate by a tiny front porch like I was, don’t be! 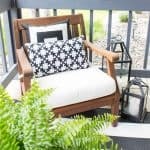 I will show you how to decorate a small patio easily and create the perfect place to gather with family and friends all Summer long. Big difference, right?! I love it and I’m so glad I finally decided to tackle decorating this space. 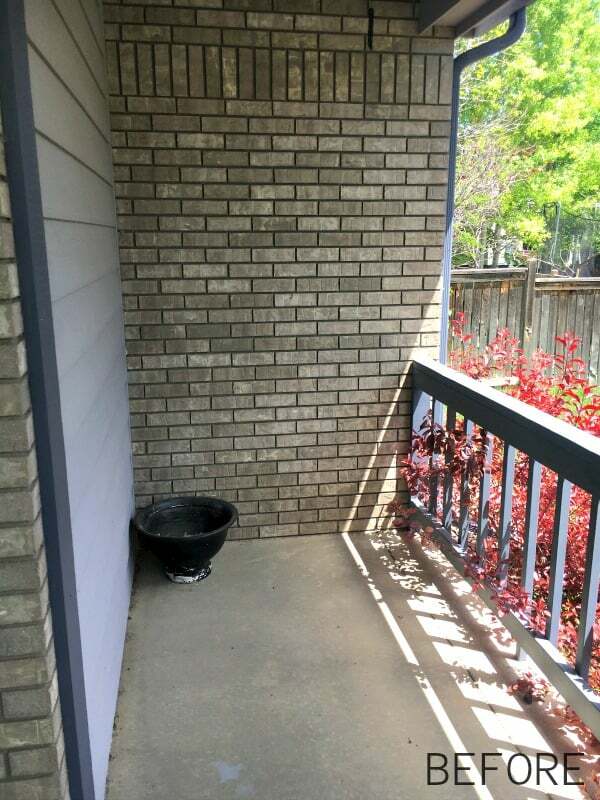 You see, my porch patio is small, like 4 ft by 8 ft small. 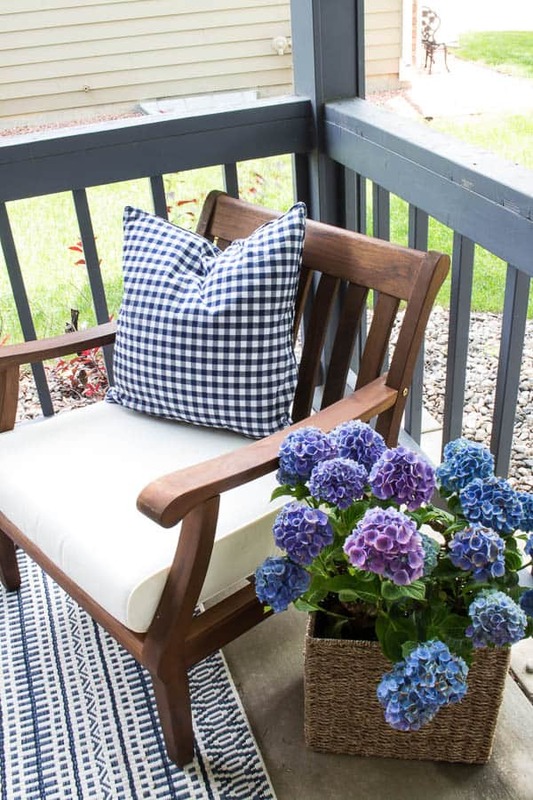 You can tell from the picture below that it’s basically like a side porch. So I had to get creative with my seating options. 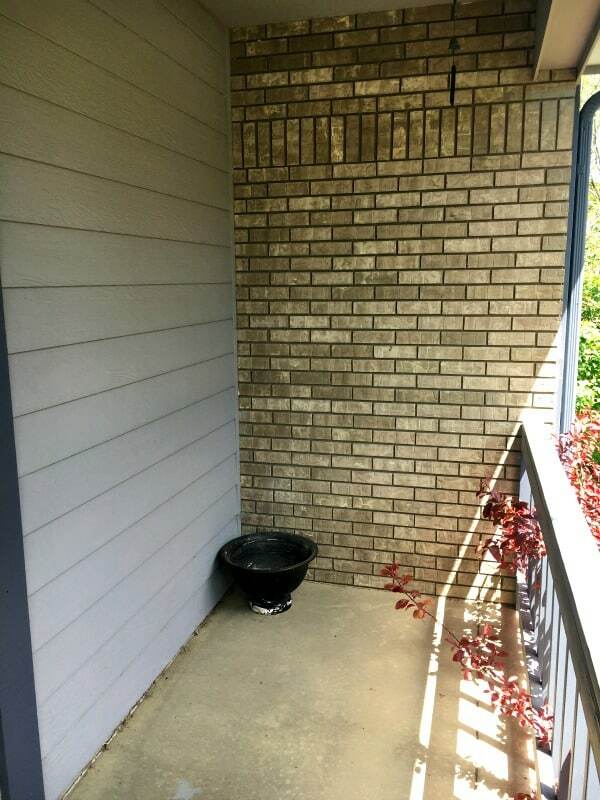 I searched and searched and finally found a bench I could squeeze into the space against the back brick wall. I didn’t want seating on the longer, house siding wall because then the view would be our neighbors home. Boring! With the bench on the back, the view is facing out towards the street. It’s perfect for watching the boys ride their bikes or play in the yard, plus it’s tucked away so it’s more private. Win/win! I loved the bench’s matching coffee table and side chair too. I knew the opposite corner would be perfect place for someone to lounge as well. So after I found the furniture I went hunting for the perfect rug to ground this space. Finding a rug that squeezed into this tiny area was almost harder than finding the seating. I really needed a 4ft by 8ft rug but all the ones I liked were either bigger or smaller. What’s up with that?! 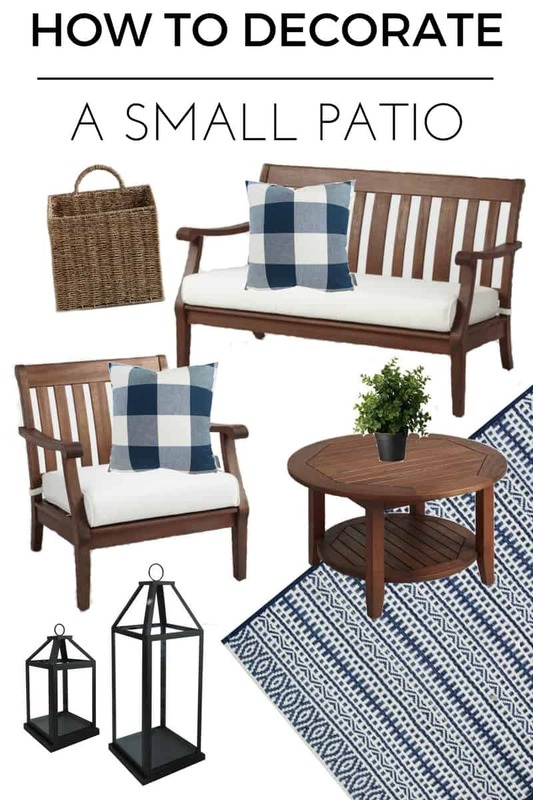 I accidentally found this blue and white rug on a whim one day. It was on sale, but a little too big. I decided to risk it. As soon as I got home, I placed it on the porch. It was perfect except just a little to wide. To remedy the extra couple of inches, I just folded one side under. No one will even notice. I scored the pillows at Home Goods. I got three but wish I would have bought all four. Of course, when I went back a few days later it was gone. 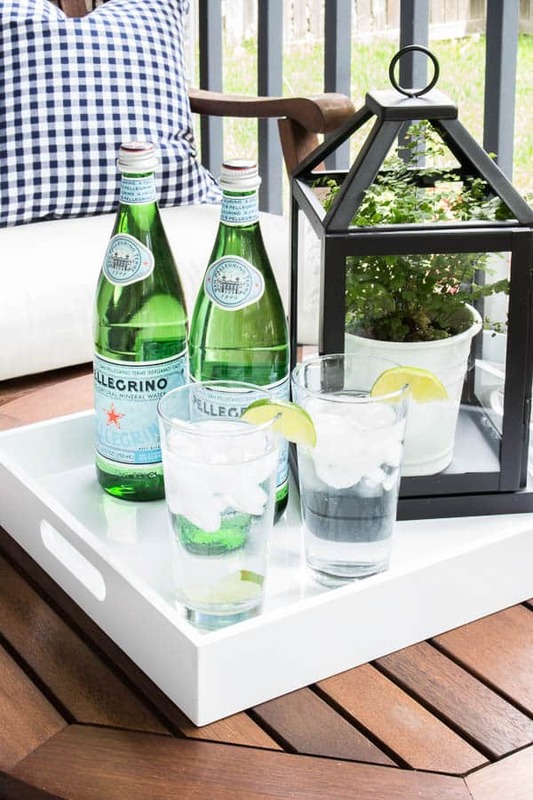 Tip when shopping Home Goods: if you think you might want it, BUY IT. Or someone else will. The final touch was a few accessories like these lovely black lanterns, a fun tray and a little more green with a cute fern. 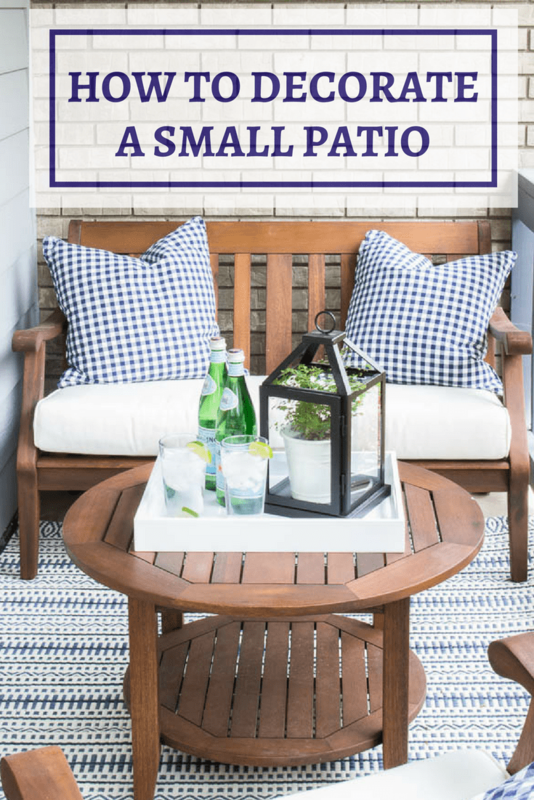 Basically, when it came to decorating this tiny patio, I had to think outside the box. 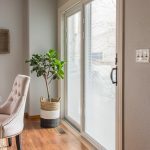 😉 But everything I purchased for this space was either on sale or I shopped my home. All together, I only spent a couple hundred bucks to take this neglected space to the most popular hang out at our home. I think the only accessory left to add is me with a magazine. 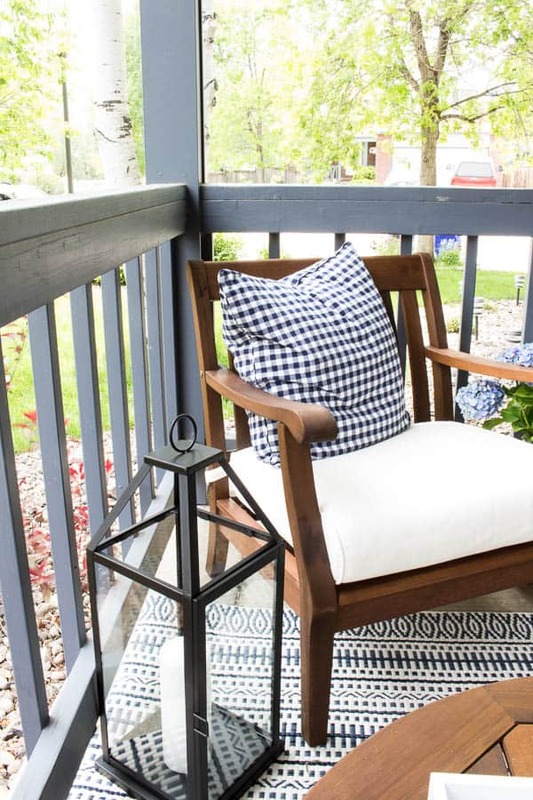 I will be showing a few more pictures of the whole entire porch/patio area (including the front door) in my Summer Home tour coming next week! Too shop, simply click on any picture below…. 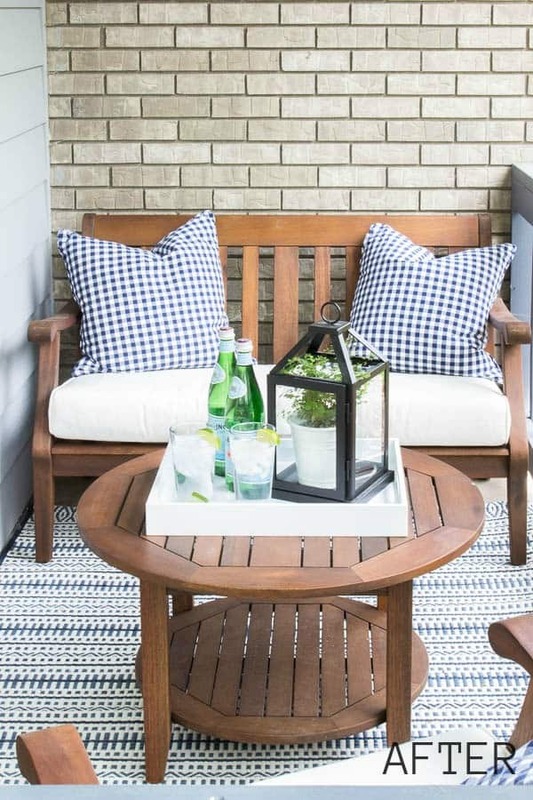 Does your home have a front patio? 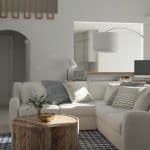 Another budget friendly way to update your home is with paint! 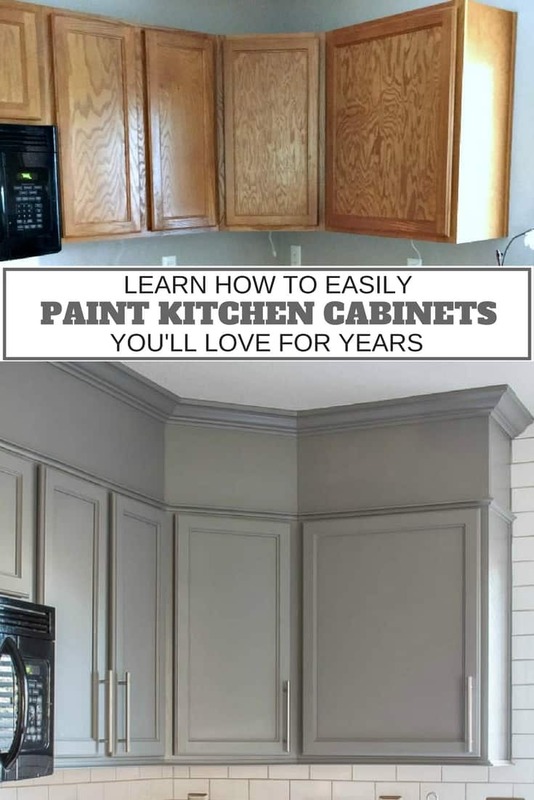 Be sure to check out my post on how to update kitchen cabinets you’ll love HERE! « Concrete Tray | Save the Date! 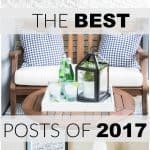 This post was so helpful! 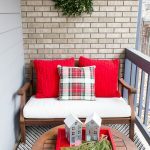 I live in a condo and have been trying to find ways to make the balcony an inviting spot! Thank you! 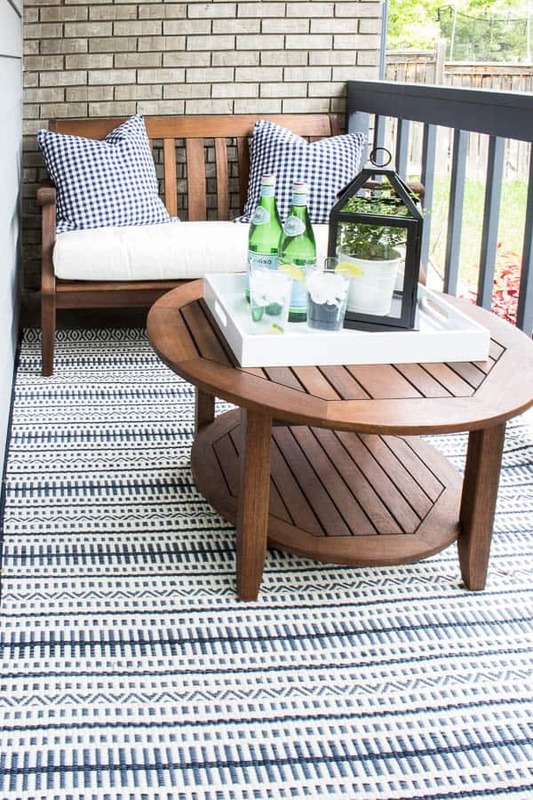 Laura – your patio is lovely and doesn’t look small at all. 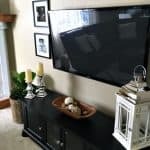 Your tips are so helpful – plus the decor you found is beautiful! 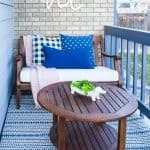 Love the patio! You make it look so welcoming! It doesn’t look small anymore! Laura! Beautifully done! 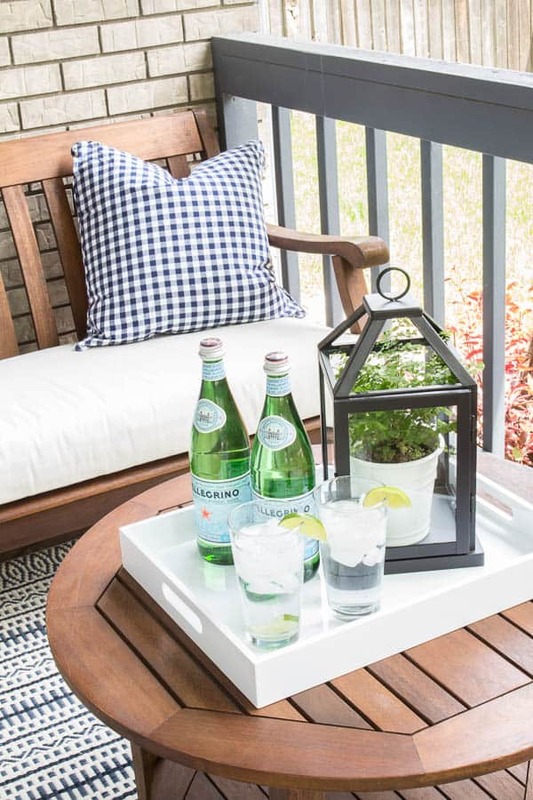 By chance, where did you find your patio set?